As a child, I remember when walking with my Dad past very tall grasses or cattails that he would say in an excited voice, “Looks like a great spot for a tiger to hide!” Invariably, now when I see similar grasses, I think of him and tigers. For Dad’s 85th birthday this coming July, I painted this piece. (He just “opened” it yesterday because I am here on the east coast visiting Mom and Dad.) I thought it would be fun to add a bit of excitement to the piece..... footprints going to the water’s edge. Hmm, I wonder when the tiger last ate. 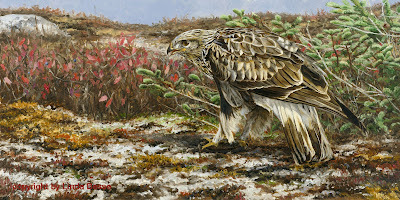 A large buteo, the rough-legged hawk is the diurnal avian master of the arctic. It nests mostly from the edge of the tree line and north. Feeding almost exclusively on rodents, it hunts by gracefully hovering over fields, marshes, and tundra. On my WREAF trip in October 2008, I saw two light morph rough-legged hawks. One was in flight, the other on prey. I used my close-up reference shots of the latter one and moved him to a select spot of tundra which I saw on one of my hikes. Some of the tundra color had faded with the lateness of the season on that particular hike, so, I just made it earlier. 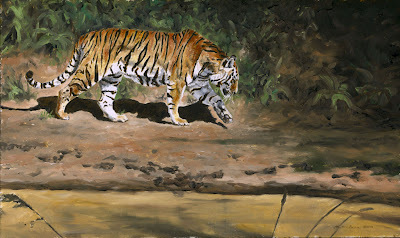 The Bennington Center for the Arts presents Art of the Animal XIV. The show runs June 13th - July 26th at their museum on West Road at Gypsy Lane (VT Route 9), Bennington, VT. The opening weekend is June 13th and 14th and I will be attending. This is a world class show juried by renowed artist Terry Isaac and I am thrilled that he juried in TWO of my paintings. The show is limited to under 90 pieces consisting of paintings and sculpture. Wonderful lectures fill the day on Saturday, June 13th, and there will be time to chat with the artists if you have a chance to attend. 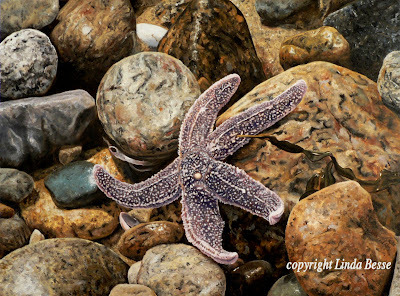 Original Oil by Linda Besse.................30" X 25"
Putting interest or power into a small painting is an exciting challenge. Not only do you have to deal with using smaller brushes and minuscule eyes, (aaaggghhhh! ), but the composition is just as important as in a large statement piece. 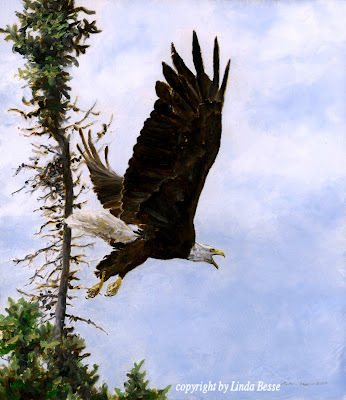 In Eagle Study, I created a muted wispy sky to dramatize the bird's wings. 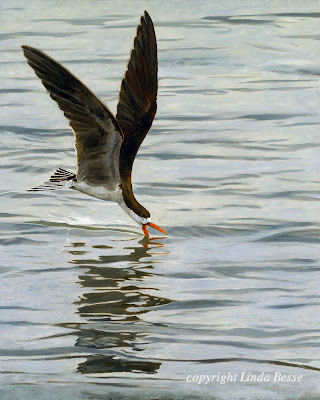 Strength is also portrayed with the posture and the open beak.